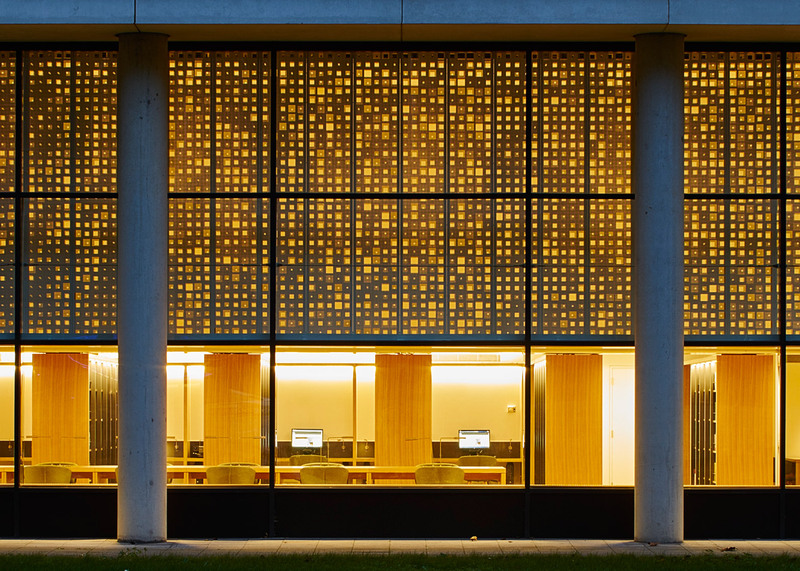 Coffey Architects has added a library with a perforated facade to London's Science Museum, as part of a major redevelopment that will also include galleries by Muf, Wilkinson Eyre and the late Zaha Hadid. The Dana Research Centre and Library occupies the lower two floors of the museum's Wellcome Wolfson Building in South Kensington. 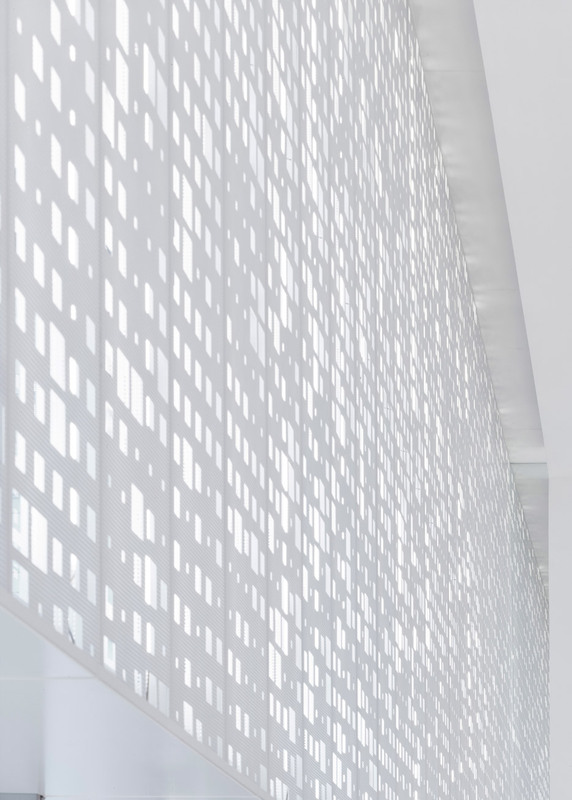 The upper floor is covered by a white screen with thousands of tiny openings, which create a dappled lighting effect for the interior. 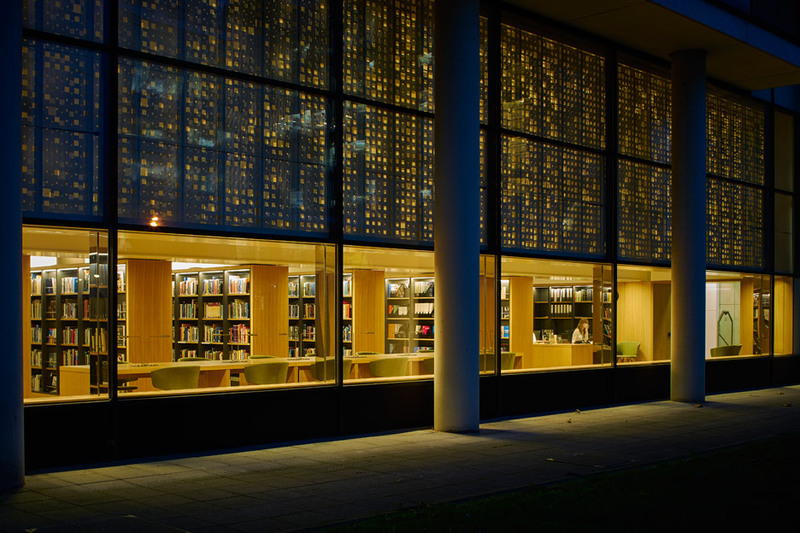 London-based Coffey Architects designed the space to reference the story of scientist Isaac Newton, who is said to have first discovered gravity while sitting under the shade of an apple tree and witnessing fruit falling from its branches. "The dappled light effect was inspired by the contemplative conditions that might have been experienced by Isaac Newton while he sat under the apple tree," said the design team. "This double-height canopy also filters sound, as well as views to the landscape outside." 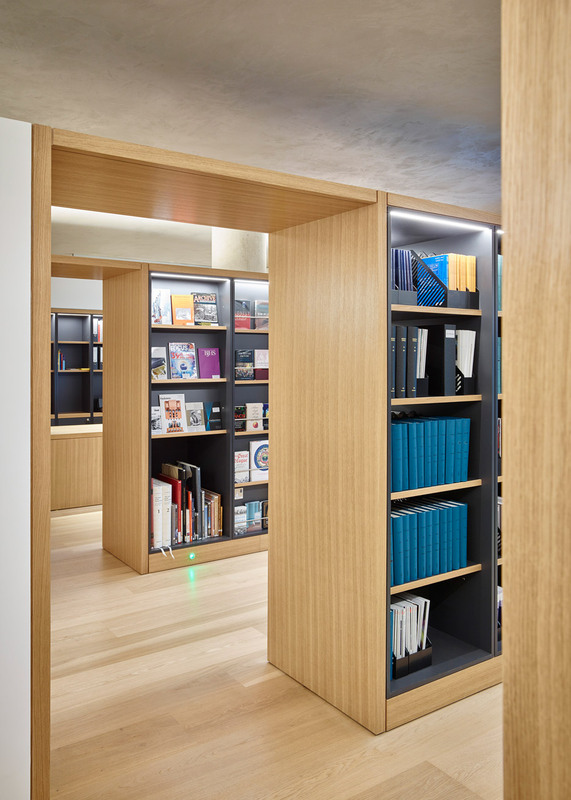 Inside the centre, timber-lined bookshelves, walls and desks contribute to a warm and light-filled setting. 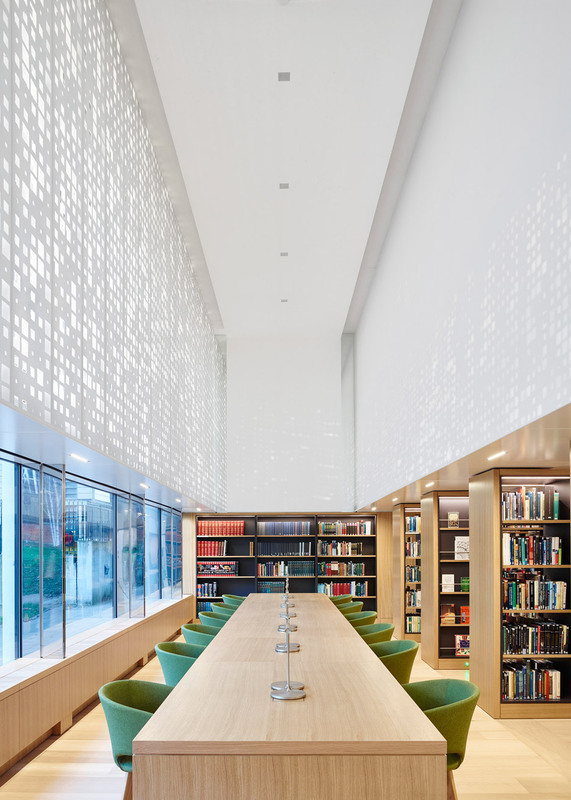 A long reading table is set in a double-height space by the glazed facade of the building. To its rear, wooden bookshelves occupy single-height spaces, and a staircase leads to a mezzanine with a common room and staff areas. "The scheme itself is a simple idea to recreate the feeling of sitting under a tree, on a summer's day, reading a book," said studio founder Phil Coffey. 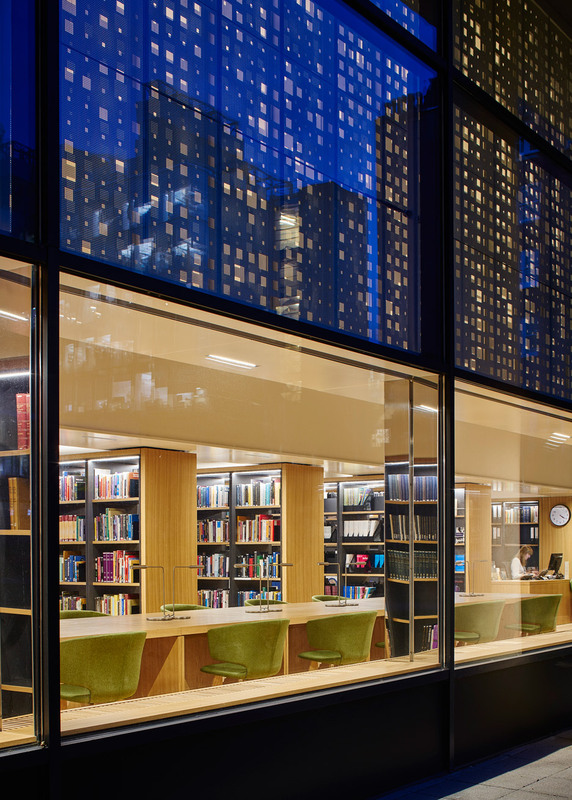 "The canopy creates light and acoustic conditions conducive for study, as well as offering a unique space with a strong identity to be enjoyed by both casual and academic users." 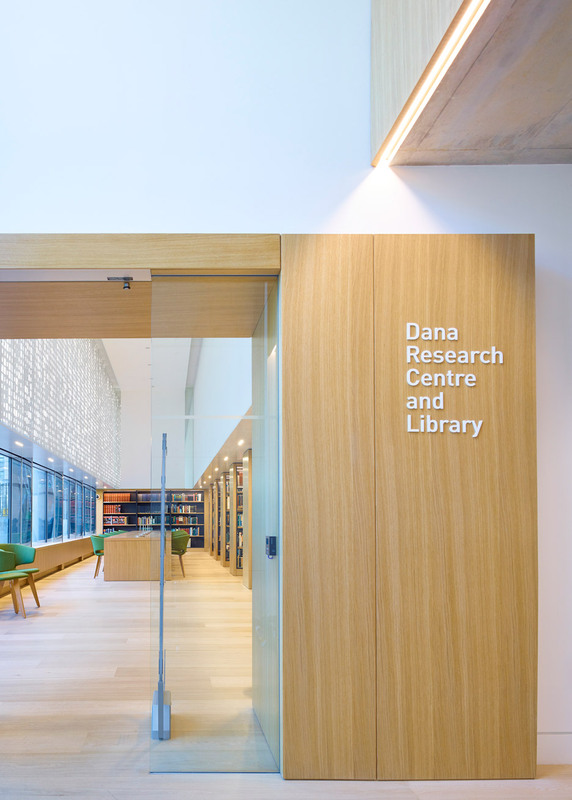 The Dana Research Centre and Library provides access to over 500,000 documents for researchers, staff and the public. It is the first part of the campus overhaul to the complete, with the final phase of the project is expected to finish in 2019. "This fantastic new centre offers free public access to world-class library and archive collections for science and engineering, as well as providing flexible space for the museum's doctoral candidates and researchers to work alongside our amazing collection on a day to day basis," said Nick Wyatt, who is head of the museum's library and archives. Other projects included in the £60 million redevelopment of the Science Museum are a suite of health galleries by Wilkinson Eyre, interactive galleries by Muf and a maths gallery by Zaha Hadid – who died suddenly last week. Barber and Osgerby's interiors firm Universal Design Studio previously designed a gallery dedicated to communications technology for the museum as part of a separate project. Coffey Architects, which was set up in 2005 by Phil Coffey, has also designed a brick-clad headquarters for a Chinese steel company and a house extension in Islington, north London, that brings in light through a sunken courtyard. Photography is by Timothy Soar.